I have never talked to anyone who declares that they dislike Berlin. 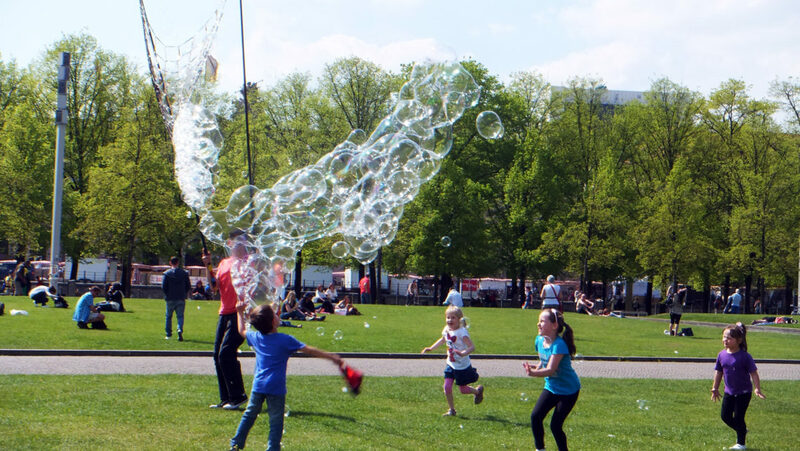 Having spent 5 months in Berlin in 2013 working in the city’s center while living in one of its most complex neighborhoods, I have gathered these 8 things that I miss the most (and I think you do, too) upon leaving Berlin. Check this list to see if we’re of the same minds. If you have not visited Berlin, bear in mind all these experiences so that you won’t regret upon actually being there. 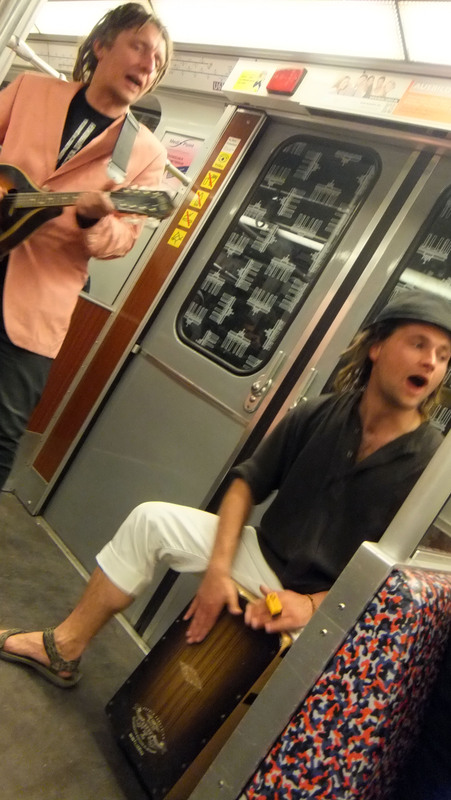 During my 5 months of living in Berlin, I had spent an incredible amount of more than 50 euros on street music performers. As I never paid more than 1 euro for a single performance, I reckon I must have bumped into at least 60 street performances within 5 months. Not all of them was great, of course. Yet there were always elements of joy, passion and freedom being transmitted through the music that they played on the street. In Berlin, street artists can be found anywhere. 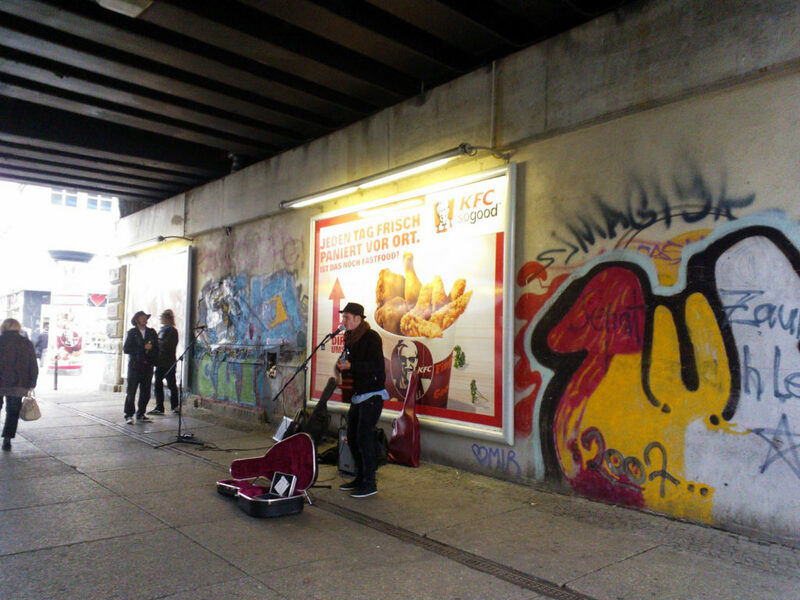 There are single performers like this guy here who play under the S-Bahn rail with his voice rising far above the noisy sound of trains coming and leaving. I took the S-Bahn every day. Saw him only some days. Yet after all, he was the memory that remained as I said goodbye to Berlin, rather than any train ride. There are also groups of artists performing open-air concerts with different types of instruments. The money they received might not make up for their time and efforts, but not a single moment throughout their performance did I feel their enthusiasm and passion dropping. Every time they finished a musical piece, they gave the audience the most satisfying smile without even glancing at the money box. If you’re lucky, you might also bump into these guys. 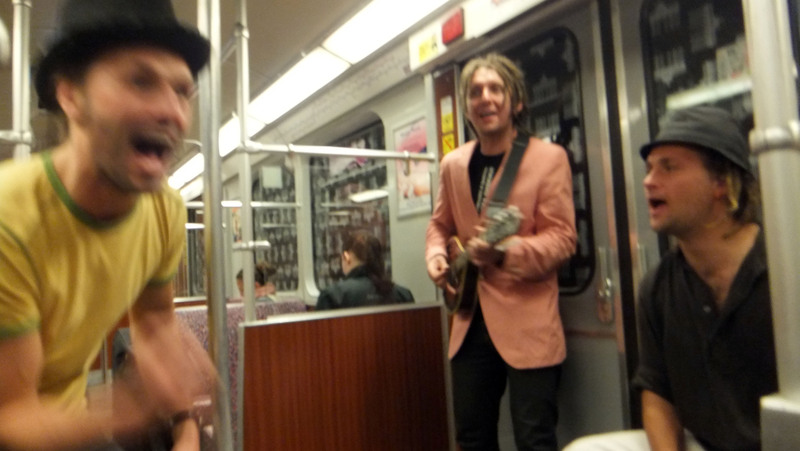 They’re the funniest band I’ve met on all my train rides! This stunning architectural work is the second most visited attraction in Germany after the Cathedral of Cologne. 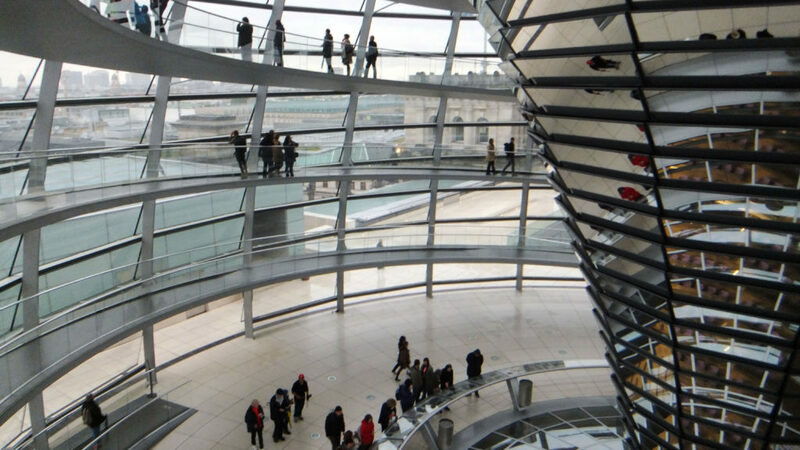 From the glass dome on top of the Reichstag Building, you can have a 360o view of Berlin city. You can also look into the parliament’s main hall below the glass dome, obliquely indicating the parliament’s openness in its operations. Currywurst (sausage with curry sauce) is quite popular in Berlin. No matter how strong your craving for currywurst might be, remember NOT to visit any Currywurst Express fast food chain. Trust me, both their sausage and curry sauce will certainly not live up to your expectations. The most popular currywurst stall in Berlin is Curry 36 on Mehringdamm in Kreuzberg District. However, there’s a secret currywurst stall right in the city center that tastes even better I think. This stall is run by a man from Thuringia and sells the BEST curry sauce I have ever tasted in Germany. Back in 2013, a set of one sausage with curry sauce and 2 small breads cost only 2 euro. No doubt I was a regular customer there! 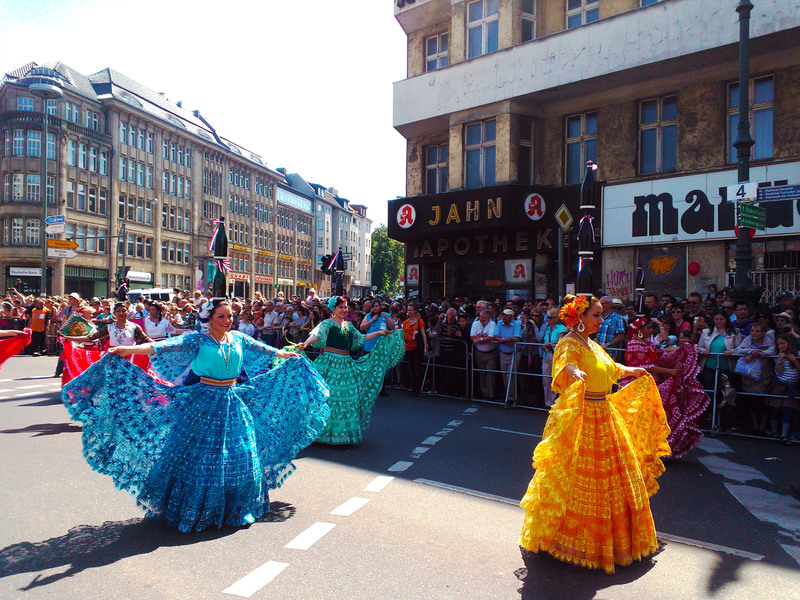 Berlin’s annual Carnival of Cultures is an event you surely don’t want to miss if you are planning for a summer trip here. 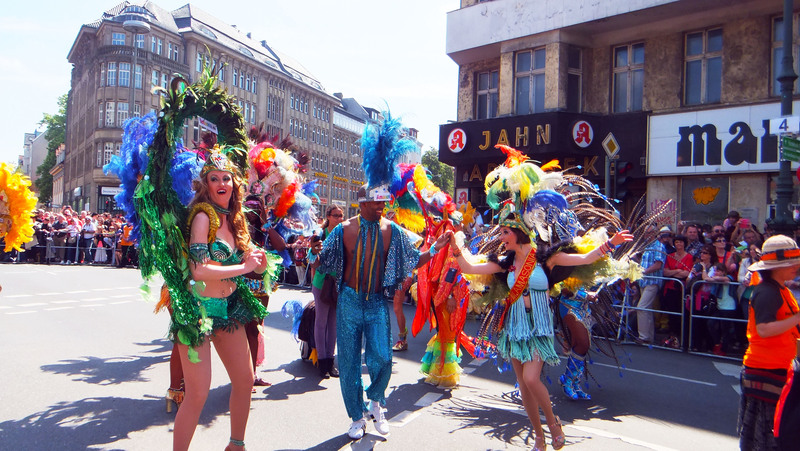 The Carnival features a colorful street parade in which Berlin residents of different ethnic cultures showcase their best performances. 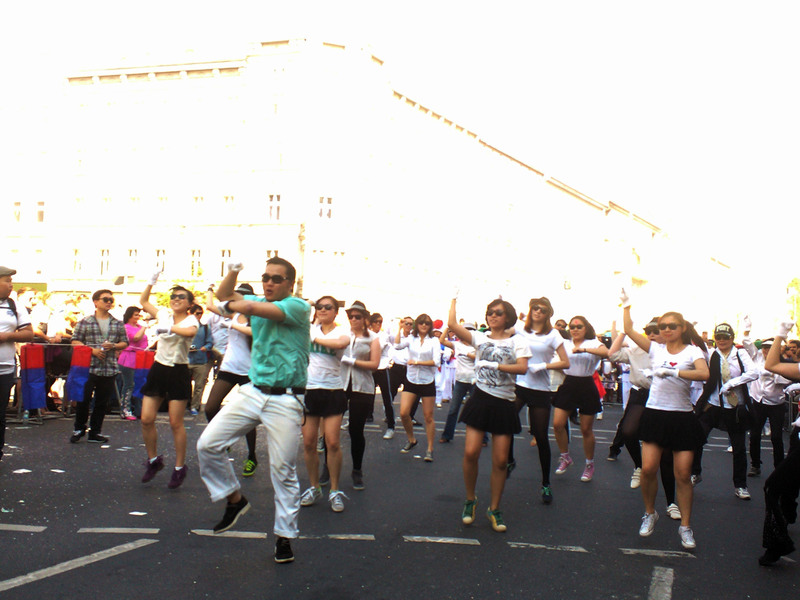 I had the opportunity to watch this parade in the summer 2013 and was most impressed with the Korean group, who dressed as PSY and gave a stunning performance of Gangnam Style on the street. You might bump into Jonny’s story upon walking on Rathausstrasse. I noticed a small camp set up on the sidewalk on my first working day in Berlin. It stood opposite to our office’s building, making sure that I’d see it at least twice every single work day. 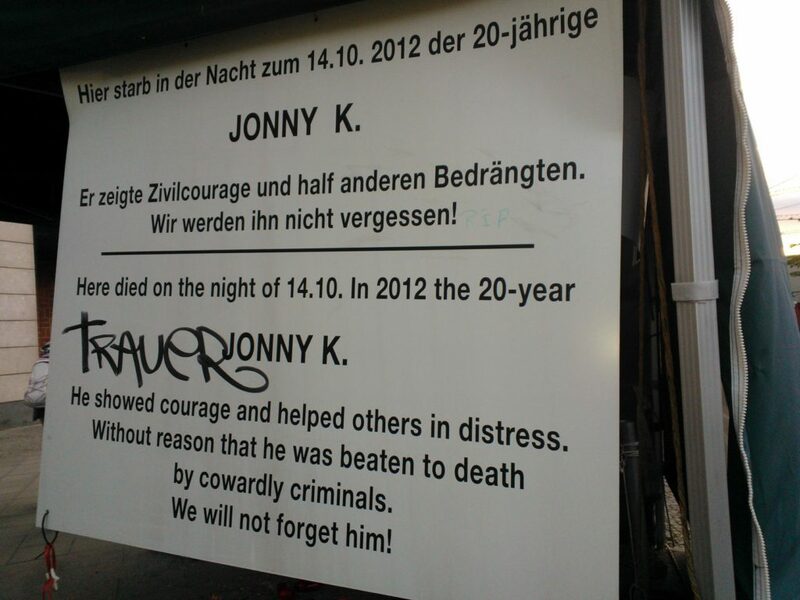 The camp turned out to be a memorial, to someone named Jonny K.
In the night of October 14th, 2012, Jonny K. – a boy of immigrant background – was beaten to death after his group of friends had a quarrel with another group of young men. I took these photos on October 14th, 2013 – exactly one year after Jonny’s death. That was also the last time I had seen this memorial. I left Berlin the next day. 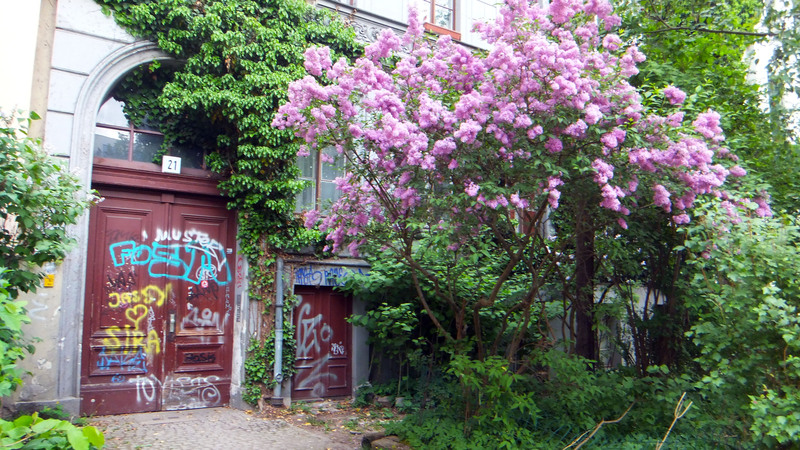 Berlin always surprises me with street corners like these. I guess I need not say more. 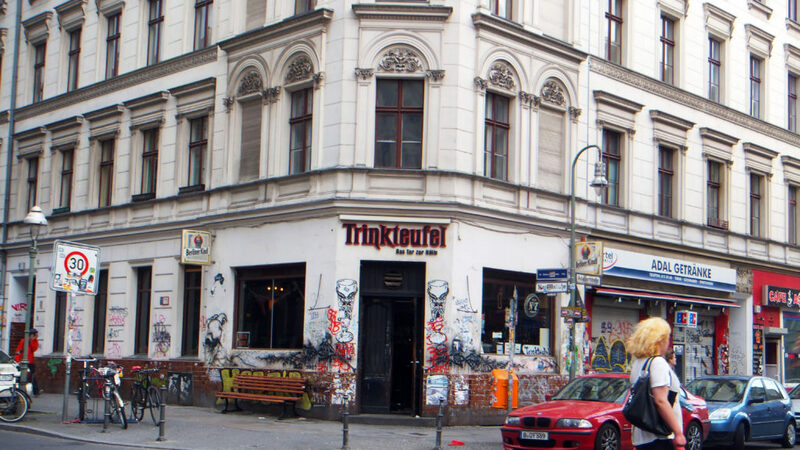 There are historical landmarks galore in Berlin. What I like most about the city’s (and Germany’s) approach to its history is the openness and truthfulness that they express. Stories about the East-West separation are openly discussed. Images of Jewish victims are exhibited on the main streets. An open reading space is built right at the very place where Hitler’s government burned books. And so on. 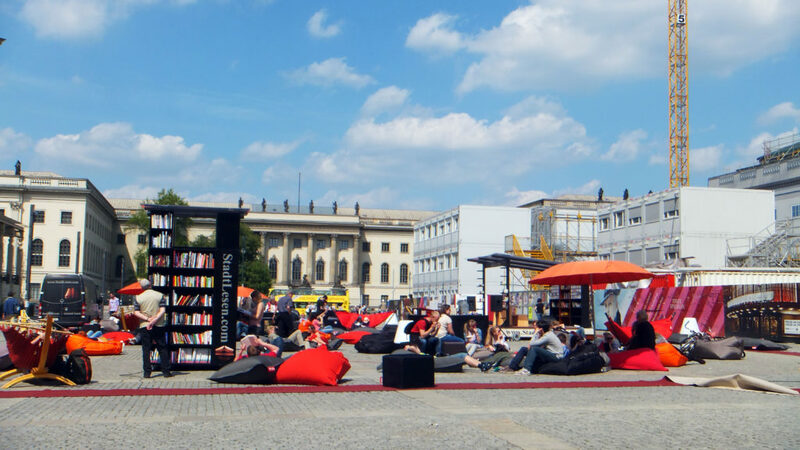 Once a book-burning place under Hitler’s regime, this square has now turned into a comfortable public reading space. The Holocaust Memorial is the best reminder of the past in my opinion. It’s a large open space where cubic stones are placed at different positions. As you walk through these lines of stones, the path leads you up and down. The greatest thing about this Memorial is that although there is no word or image displayed, its effects on visitors’ feelings are truly impressive. The Memorial evokes different feelings in each person. While I felt like walking among the different life stories of the murdered Jews, my companion that day felt as if the up-and-down paths leading around the Memorial had been paths connecting all of us through the past, present and the future. 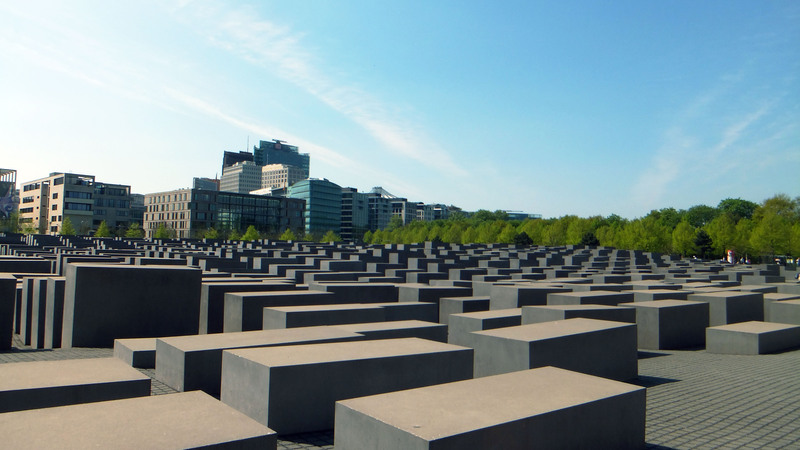 What was your feeling upon visiting this Holocaust Memorial? 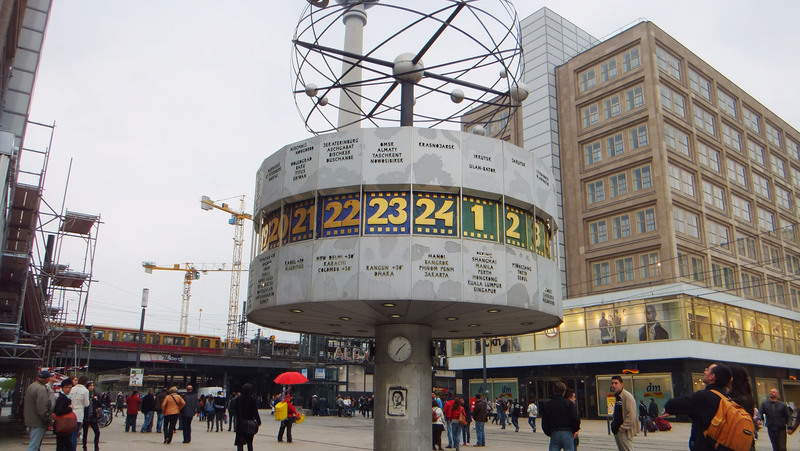 If I had to choose one place to define Berlin, I’d definitely pick Alexanderplatz (or simply “Alex” as called by locals). Conveniently located in the heart of the heart (in the center of Mitte – the central district of Berlin), Alexanderplatz is the most vibrant public square in Berlin where amazing street performances take place, where you can dream about other destinations you still need to conquer by looking at the World clock, where strangers are willing to answer your random questions in a friendly way and where you can feel the strongest atmosphere of internationality. This place is exactly what Berlin is all about: quintessentially German and utterly international at the same time. Have you been to Berlin before? Did you miss the same things when leaving Berlin? Feel free to share your experiences by commenting below, so that future travelers have a better idea of how awesome the city is. 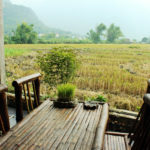 "Thank you so much :)"
"Yes it is so sad when traditional values become..."
"Hi Jan, thanks for reading my blog post about Ha Giang. I..."
"Thank you very much for your comment! 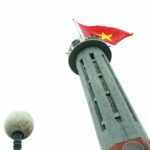 Great to know you..."
"Hi Clara, 2 days are not enough for Hanoi I think. It..."
What a cool idea for an article! I have never been to Berlin, but it sounds like an interesting place to visit. I’ll have to add it to my list! Isn’t it funny the things you miss about a city once you leave? I really want to visit Berlin! I have family in Germany and have been trying to figure out when and how to fit a trip in for a year or so, this list is making it harder to push it aside again! The video is great! 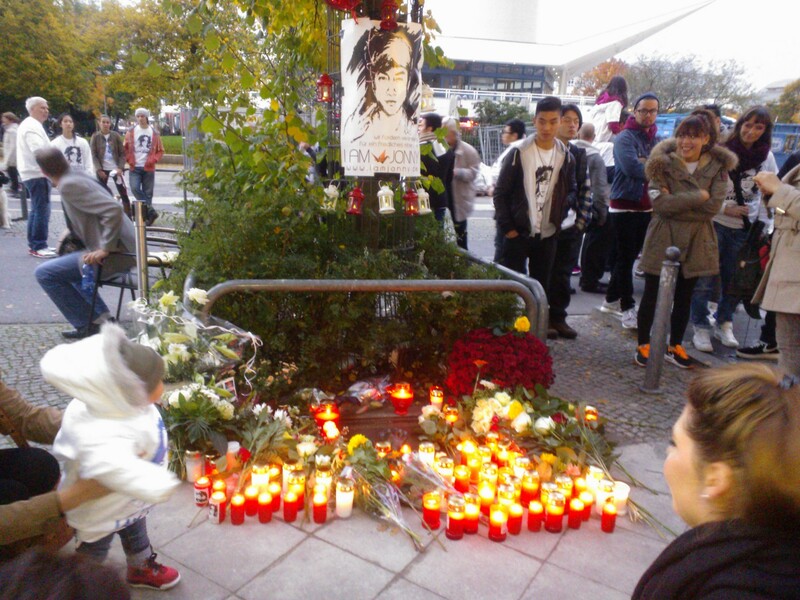 I think we lived in Berlin about the same time – I’ve been there from Sept to Dec 2013 and loved every single moment. Since then, I’ve been planning how to return. Whenever I got asked about my favorite city, it is always Berlin, for so many reasons. Berlin has a great vibe! I need to get to that summer carnival. Love how you described the Reichstag too! I’ve never been to Berlin, but this definitely makes me want to! It’s a no to the currywurst from me though haha, I’ve always thought that was super weird. Berlin is one of those places that’s been on the tp of my list to go to. But I just have never gotten there. I think once I do though I won’t want to leave! 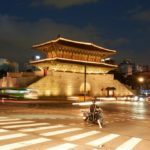 This post is full of all of the many reasons I want to go there. Thank you for reminding me I need to make sure I get there this year! Those street corners! Wow. European cities certainly know how to make their streets pretty. I wish Australia had taken a leaf out of that book. Gave me a giggle about the currywurst! I can’t hear anyihtng over the sound of how awesome this article is. Berlin seems to have such great energy! That’s the best part about blogging and traveling is getting the opportunity to experience so many different places- I always miss the countries i’ve been once I leave, but at least there is always another opportunity to come back! I just realized in that in my short two-day, one-night trip to Berlin…I didn’t see any of Berlin AT ALL. I’ve also heard Berlin has a pretty good night life as well…would you agree? I love this article concept! The truth is I’ve only been to Berlin once and only for a week that was dominated by work…I really want to return for a bit longer, strictly personal trip and I absolutely want to see/experience everything on that list – especially the Carnival! WOW, it’s great to read an artikle about a different Berlin, the day-to-day Berlin! I love this city and I think your article revealed a lot about the city’s personality. Thanky for sharing! I have been in Berlin several times already and your pictures and your descriptions are really spot on. THIS is Berlin! I remember that the Holocaust Memorial got a lot of critics when built and I do think it looks a bit lame or weird, but when you walk through it, it’s an experience, really. Have you been to the Jewish Museum with their indoor garden? My husband an me felt sick all day from it . I haven’t been to the Jewish Museum. How did it make you sick? I was in Berlin on a day trip and even in that 1 day I experienced almost all that you say here. I was sitting close to Check point Charlie in the evening at a square and listening to street musicians and that’s one of the most memorable evenings of my life. Sadly I couldn’t visit Reichstag building. I did find Currywurst everywhere but being a veggie didn’t try it! I have only heard great things about Berlin and would love to visit one day! I’m sure I would find the whole hipster scene and creativity quite inspiring. 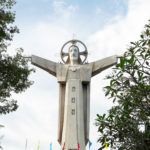 Great article, I habe been delaying a trip to Germany for no reason, but Berlin seems to be a wonderful starting point. I’m very much into history, so I was glad to see you mentioned the reminders of the past, especially considering the impact of Berlin on the meanders of 20th century history. I seem to believe that food is a big thing in Berlin, am I wrong? I love this list – you’ve hit the nail on the head when it comes to things people miss after visiting Berlin! I 100% miss the Currywurst and know that wherever I travel to, I will never get anything that is quite as good! It sounds like you’re still missing Berlin. I was only there briefly in 2002 for an unplanned trip to the ‘Love Parsde’. I must go back! So much to see and do – also not an expensive city. It really surprised me to read about curry in Berlin. I spent a month in Germany and don´t recall ever trying curry there, but I definitely had a lifetime’s worth of sausage! I never visited the holocaust memorial, but did make to Auschwitz which was quite a haunting experience! I haven’t been to Berlin yet but I have read plenty about it and I’m sure I’ll love it. 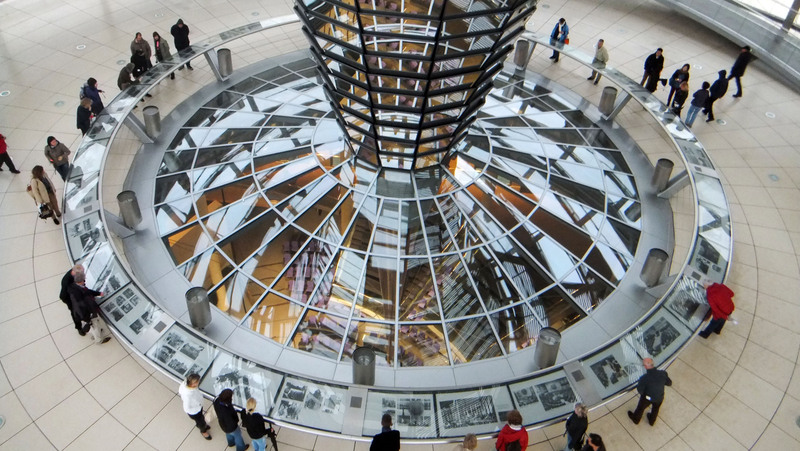 I’m looking forward to visiting the Reichstag Building and I already have a love for Currywurst! Wow, you were lucky to work in Berlin for 5 months, I have visited on 2 occasions and wish I could have spent more time there! 5 months sounds like a decent amount of time to get to know it well. I’m not really into street performers but I’d certainly miss the Reichstag Building as you said, it’s really beautiful. I love Bratwursts, so would definitely miss these after 5 months! I never knew about the carnival, drink and dance sounds like super fun! Berlin… I lived there for 5 years before I now moved to Switzerland. Yes, it is an amazing city, fantastic spirit, especially when you are lucky to work in the start up scene. 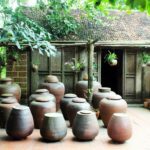 There is so much to discover and so much diversity… for tourists definitely a must see place. I agree – one of the most amazing things is the Carnival of Cultures, incomparable.